Have you ever played "What's Wrong With This Picture?" Well, take a look at these "before" photos of the kitchen at Sassy Seagull cottage and let's play! What's wrong with this kitchen? Some of the things that stand out to me are (1) the countertop and cabinet end at a window (2) there is a electrical panel box next to the upper cabinet which violates code and (3) the overall look says "tired". Here's another view of the room...What else do you see? At first I wondered if an appliance was missing at the end of the counter to the right of the sink but then I realized there was a gap there because of the closet door. And although it is not obvious from these photos, the floors were buckling and we suspected (correctly) that there were structural issues to deal with. (2) Repair the structural issues to shore up the floor joists. 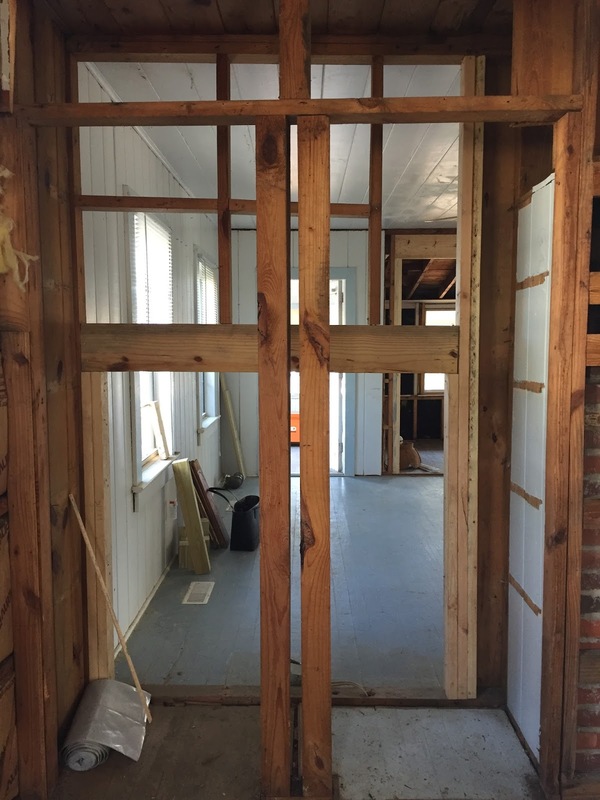 (3)Relocate the electrical panel to the new laundry/utility room. 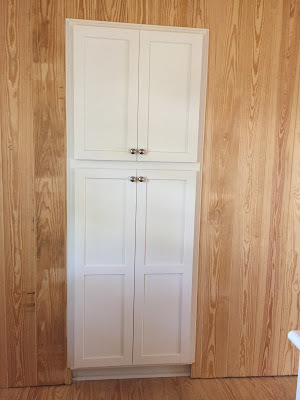 (4) Close up the window on the left side of the room so the base and upper cabinets could run all the way across to the wall. This was a tough call but having cabinets won out. We compensated by replacing the center window with a slightly larger one. (5) Replace the flooring with wood floors and clad the walls with paneling to match the rest of the house. (6) Add pulldown attic stairs so that access could be available to the attic for storage and for servicing the systems such as HVAC, wiring, plumbing. The stairs were added in the walkway that goes through the periphery of the kitchen and not in the work area. You can see just a bit of them in the ceiling on the right. 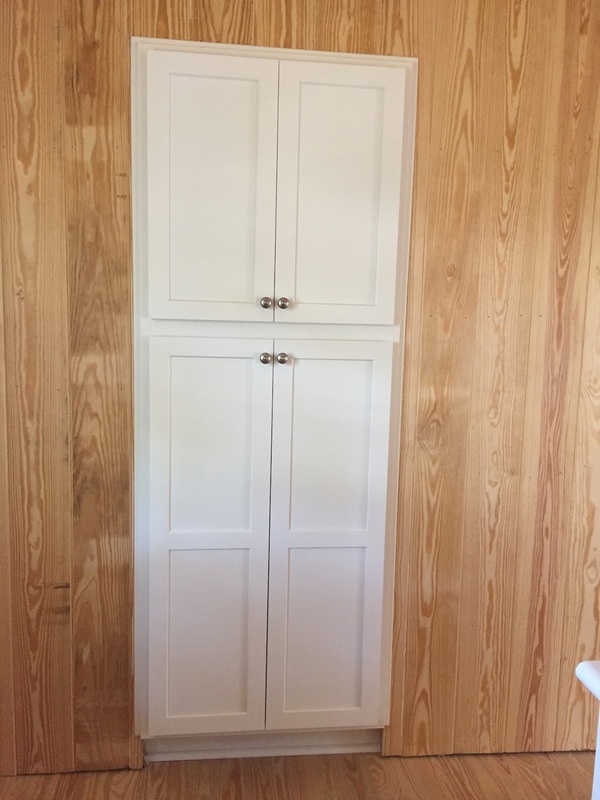 (7) Close up one of the closets on the right side of the wall so that the counter and cabinets can run all the way across without obstruction. 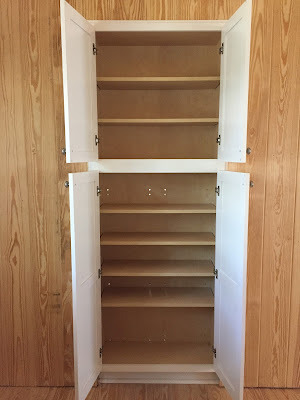 As the next photos show, the lost closet space was recovered on the living room side of the wall as a built-in bookshelf. Looking from kitchen side through to the living room before the wall is closed up. The finished bookshelf in the living room. 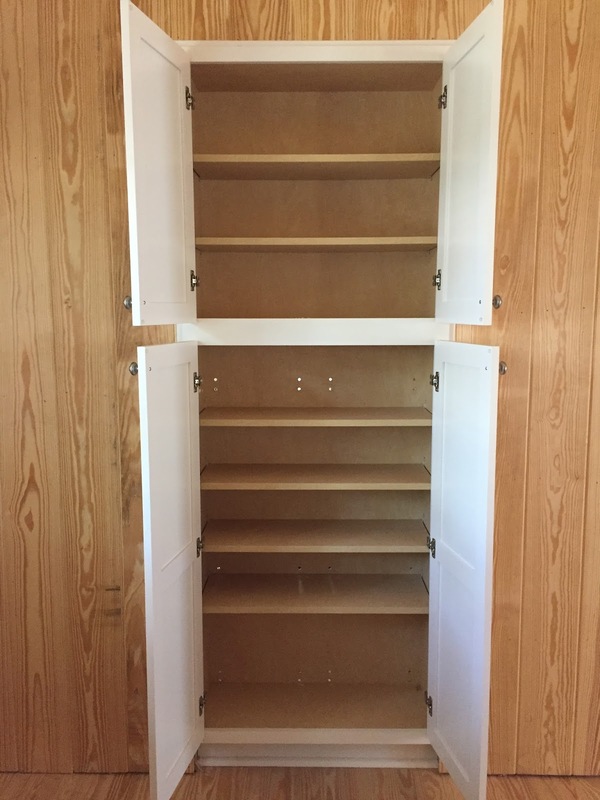 (8) Turn one of the other closets into a built-in pantry/storage area with shelving. (9) Add a peninsula for additional workspace, storage, and seating. Here's a not-to-scale hand drawing of the plan. Next week I'll show you how it all turned out!